This is a most delicious devil’s food cake. Combined with raspberries this layer cake is off the chain, as Ben says! Preheat oven to 350 degrees. Grease three 8-inch cake pans and line the bottom of each with a round of parchment paper or waxed paper. Sift together flours, baking soda and salt. Set aside. Melt chocolate in double boiler. Add cocoa and boiling water. Alternatively, chop the chocolate and add cocoa and boiling water. Whisk until smooth. Beat butter in standing mixer on medium-high speed until creamy, about 1 minute. Add brown sugar and beat at high speed until light and fluffy, about 3 minutes. Stop mixer and scape down the bowl with a rubber spatula. With mixer on medium-high, add 1 egg at a time, mixing about 30 seconds each. Reduce the speed to medium and add sour cream and vanilla – beat until combined about 10 seconds. Stop mixer and scrape down sides. With mixer on low, add a third of the flour mixture, followed by half of the chocolate mixture. Repeat, ending with the flour mixture. Beat until just combined, about 15 seconds – do not overbeat. Remove bowl from mixer and scrape the bottom and sides of bowl with spatula and stir gently to thoroughly combine. Divide batter evenly among cake pans and smooth batter to the edge of each pan with spatula. Place 2 pans on the lower-middle rack and 1 on the upper-middle rack. Bake until center is firm and toothpick inserted in the center comes out clean, 20-23 minutes. Cool the cakes on wire racks 15-20 minutes. Run a knife around each pan perimeter to loosen. Invert each cake onto a large plate; peel off the parchment and re-invert onto a rack. Cool completely. Place one layer of cake top-side down on a plate and generously spread raspberry jam all over top surface, banking it up to the edges where the cake sinks down a little. Place the second layer on top and repeat. 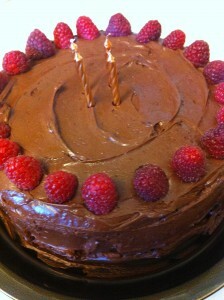 Add the third layer and generously frost the top and sides with Chocolate Frosting. Decorate top with fresh raspberries.